In honor of Earth Day we are featuring only EBOOKS in this issue. Details at the end of this post on how to enter to win an EBOOK copy of Manhattan Murder Mystery. We also have a link to order it from Amazon. I began reading Susan Bernhardt’s cozy mystery novel, Manhattan Murder Mystery, while riding the C Train heading down town. I live on the Upper West Side of Manhattan and to my delight this is an area where a majority of Susan’s novel takes place. It’s an easy read; a fun read that takes the cozy lover on an intimate walk through the streets of New York City’s Upper West Side neighborhood. The novel opens with Irina, the protagonist, finishing up a ballet lesson in her private dance studio. It is the eve of Valentine’s Day. She dismisses the class of young dancers and heads for home. Irina lives in a classic New York City Brownstone apartment building where most of the story takes place. The term brownstone refers to the building material used in the 1800s through the early 1900s. Brownstone is a granular and porous sedimentary rock classified as Triassic sandstone. The Upper West Side is famous for such buildings, with block after block of these lovely old structures, and they make for delightful mysterious happenings. Susan deftly weaves her suspenseful story within the confines of the Brownstone, giving the reader a deliciously voyeuristic peek into the lives of its tenants. But do not be lulled into complacency by the stately beauty of these buildings as Susan adeptly presents the reader with a look behind locked doors at the tenants who at first glance do not appear capable of murder. These quiet hallways and unassuming neighbors can be deceiving. In this city that boasts of never sleeping, Susan tells a tale in this suspenseful cozy mystery of lives entangled in greed and revenge. In Irina’s everyday encounters with her neighbors she begins to suspect something is not right with the couple that lives across the hall from her. Then when an untimely death occurs in her Brownstone, she cannot help herself and begins to interfere with the investigation. This novel has all the necessary juicy bits for a good cozy read. There is suspicion and shadowy circumstances. The story twists in unexpected ways and we learn about dark secrets that haunt Irina. She must come to terms with broken promises, betrayals and losses from her past. Susan smoothly weaves all the delicious elements of a cozy mystery while taking the reader through the mundane and extraordinary that make this grand city so special. In the end Manhattan Murder Mystery is a lovely trip through the streets and into the lives of people who live on the Upper Westside of New York City. 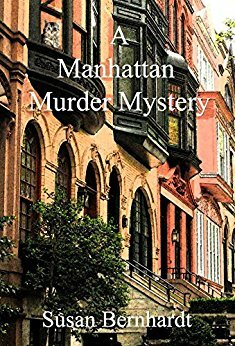 To enter to win an EBOOK copy of Manhattan Murder Mystery, simply email KRL at krlcontests@gmail[dot]com by replacing the [dot] with a period, and with the subject line “manhattan,” or comment on this article. A winner will be chosen April 22, 2017. US residents only. If entering via email please include your mailing address, and if via comment please include your email address. Margaret, I loved your review of A Manhattan Murder Mystery. Thank you so much and I’m happy you enjoyed the story!!! Hi Susan, Glad you like the review! Wishing you successful ongoing publications!! Love mysteries, THANKS! Happy Easter!! Interesting location I’d love to win it I do want to read it. This will probably be the only way I’ll ever get to Manhattan! only been to NY once but never Manhattan. Would love to read this one, it sounds like serious fun! Yay…I have been wanting to read this one. Sounds great. Please enter me and thank you for the contest. Enjoyed the synopsis of the book “A Manhattan Murder”. Would enjoy reading the book. Lorie informed me that we have a winner…Susan Blackburn from an email entry! Congratulations! I have just gifted you the eBook via Amazon. Please look in your email inbox. I hope you will enjoy A Manhattan Murder Mystery (An Irina Curtius Mystery).